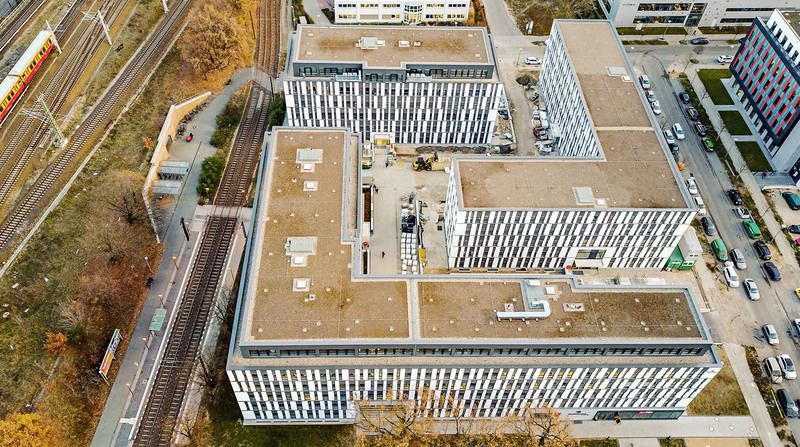 After handing over the last 113 m² of rental space, PROJECT Immobilien is able to announce that the “NUBIS” office complex in the Science and Technology Park in Berlin-Adlershof has been fully let. It was only recently that the office complex was sold to real estate investment manager Savills as part of an asset deal. The new office building on a 8,832 m² large plot on Franz-Ehrlich-Strasse 5-9 comprises a total of three buildings with five to six floors and an underground car park. The total rental space amounts to around 17,200 m². The office and commercial units of the first construction phase have already been occupied. The rental spaces in the second and third construction phases are scheduled to be ready for occupancy in the second quarter of 2019. Tenants include international companies and service providers from the construction, catering, medical, energy and IT industries.